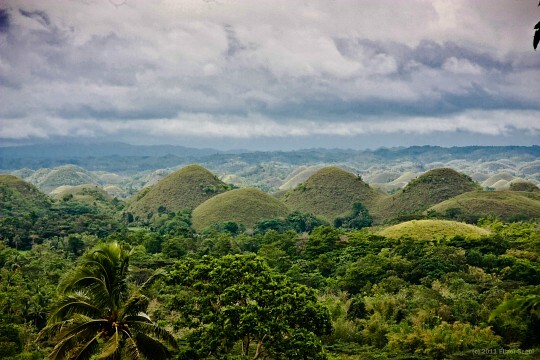 The Chocolate Hills - Chocolate Hills Natural Monument. 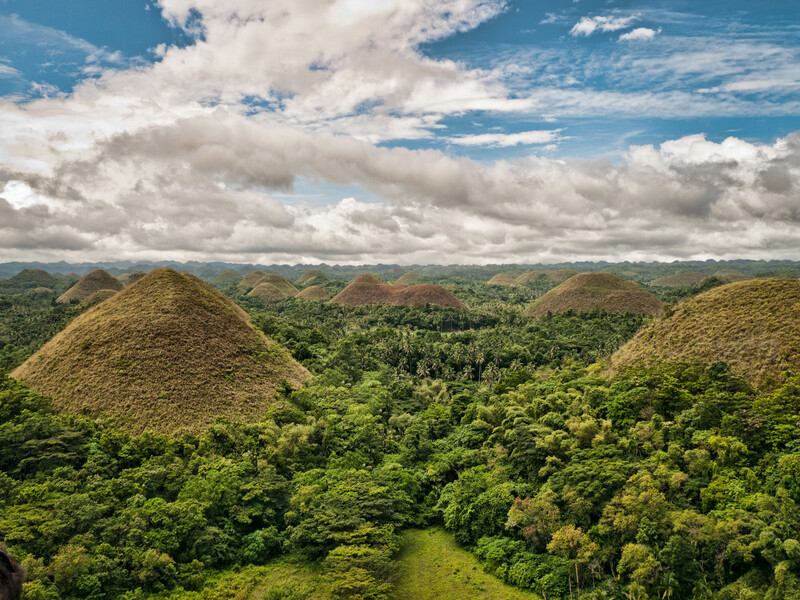 Photo by shankar s.
The Chocolate Hills is a natural monument in Bohol, and is recognized as the 3rd National Geological Monument in the Philippines. They are a geological formation that are believed to be mounds of limestone left over from centuries ago. 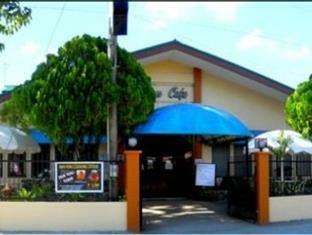 It is also one of the main tourist attractions in the province, along with the Tarsier Conservation Area in Loboc. The hills are located in the municipality of Carmen, and has over 1,776 hills spread over an area of more than 19 square miles. During the rainy season, the hills are covered with lush green vegetation all over, from top to bottom. 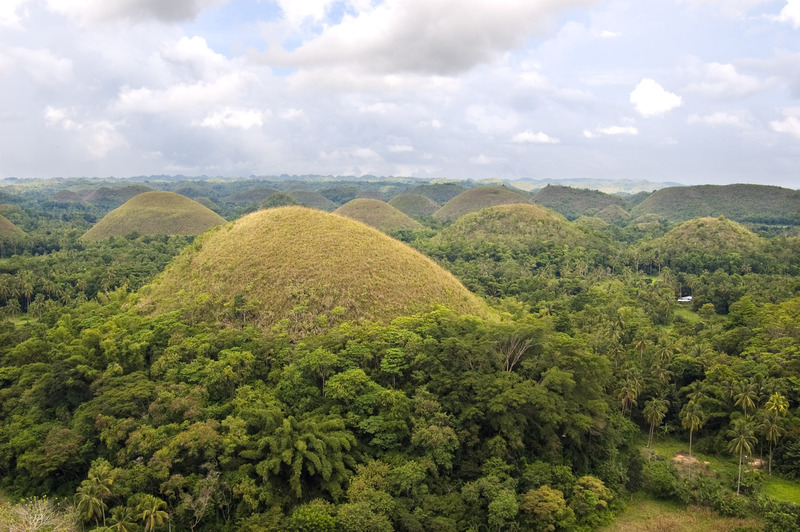 While during the summer, the hills turn brown or “chocolate-colored”, hence it was named the ‘Chocolate Hills’. The hills are uniformly cone-shaped, like Hershey’s Kisses, and are 30 to 164 feet high. Some people would describe them as molehills in the mountain, while some locals would say that the hills remind them of a woman’s breasts. 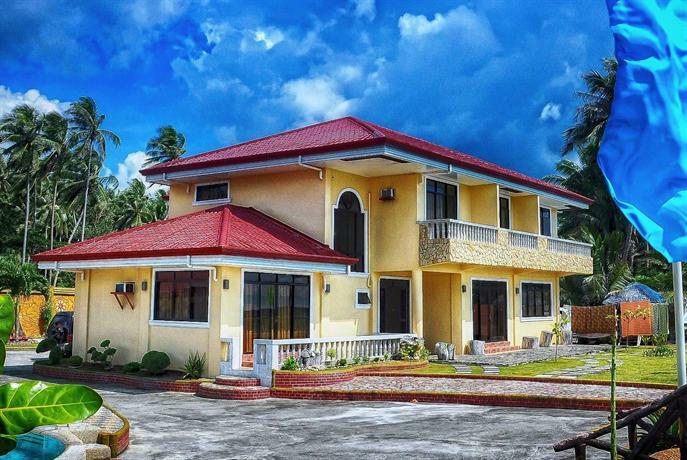 In October 15, 2013, the Chocolate Hills Complex was one of the establishments affected by the massive earthquake that hit Bohol and other neighboring provinces in the Visayas Region. The observation deck partially collapsed and the complex was closed for a few days. Today, the facilities in the complex are all fully functional and the restoration of the deck is near completion. 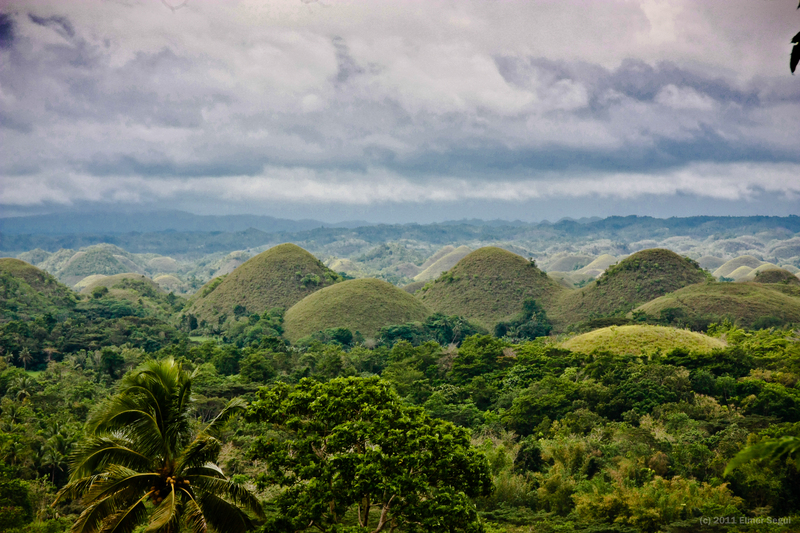 There are several popular legends or folklore that tells the story of how the Chocolate Hills were formed. The first one is the tale of two giants throwing stones and sand at each other for days. When they were finally tired of all the fighting, they settled their differences and left the island. They also left behind all the mess they made, which turned out to be the Chocolate Hills. The other tale is about a strong giant who fell in love with an ordinary mortal. After the girl died, the giant cried so hard, his tears turned into hills, as a lasting memory of his deep sorrow. Upon arriving in the Chocolate Hills Complex, there will be a viewing deck uphill which can be reached by going through a very steep staircase. Along the 214 steps to the top are rest stops or balconies where tourists can take a break and catch their breath while enjoying the scenery. 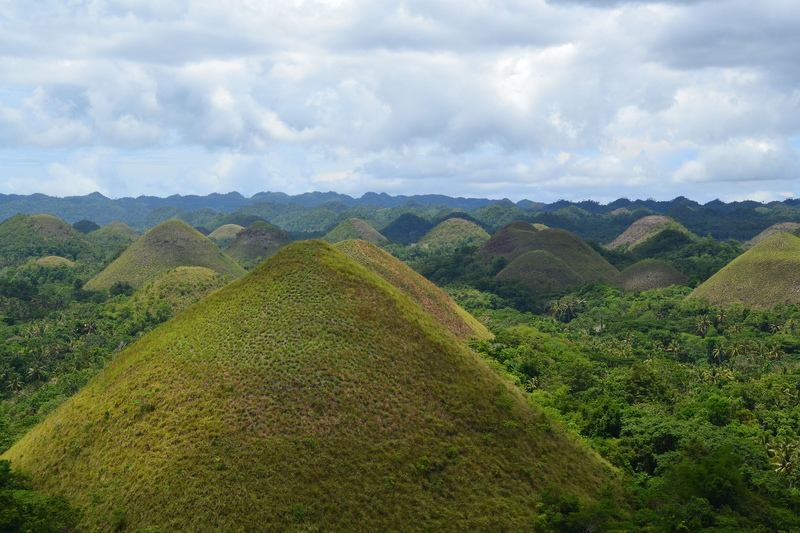 Once you get to the upper observation deck, you’ll be rewarded with a 360° view of the Chocolate Hills. The souvenir shop at the main area of the complex has a wide selection of Bohol-themed printed shirts at very affordable prices. Aside from the restaurant and snack area, there are also several local vendors that sell refreshments like natural ‘buko’ (coconut) juice and sodas. 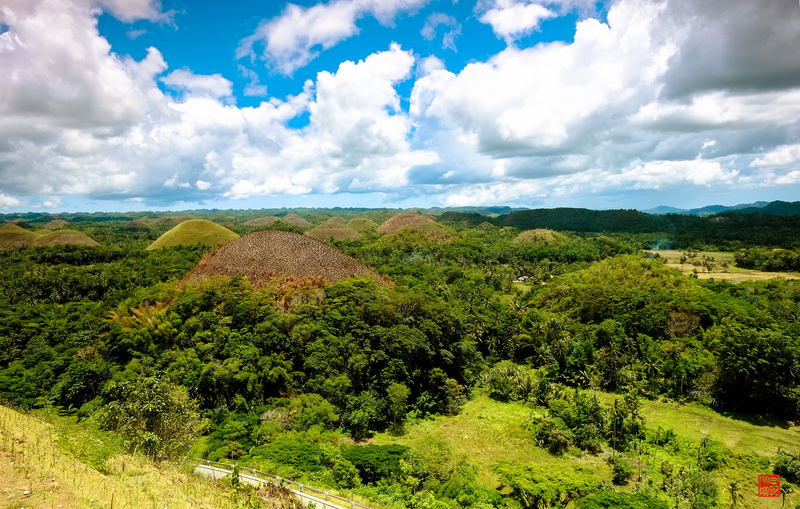 Since there are several travel agencies and tour guides around the city, you can easily visit the Chocolate Hills and other Bohol landmarks by booking a day tour. If you want to visit the hills on your own, the most convenient way is to get a rental car. For tourists who want to commute, check out this step-by-step guide on how to get there. From Tagbilaran City, get a taxi or a tricycle ride to the Integrated Bus Terminal (IBT) in Dao. Once you get there, get a bus ride to Carmen. Inform the driver or bus conductor to drop you off at the Chocolate Hills Complex. 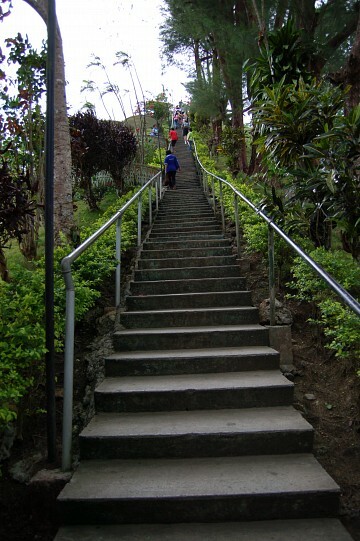 Upon arriving at the intersection of the complex, you’ll have to walk uphill for about 5 to 10 minutes to reach the main area. Tourists who are coming from Tubigon, presumably those who are arriving from Cebu by fast ferry can also take a bus ride to Carmen. Buses are available daily but takes a lot more time before it departs (there are fewer passengers in Tubigon compared to Tagbilaran City). 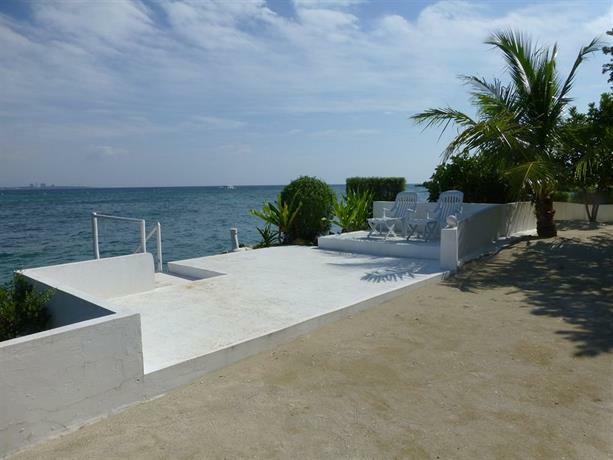 When you reach Carmen, tourists can then take a habal-habal or a motorbike ride to the Chocolate Hill Complex. Tourists who want to experience the beautiful sunrise and sunset of the Chocolate Hills can spend the night at the Chocolate Hills Complex. The complex is operated by the local government and has several amenities including a large conference room, a restaurant and snack area, a swimming pool, and a gift shop. 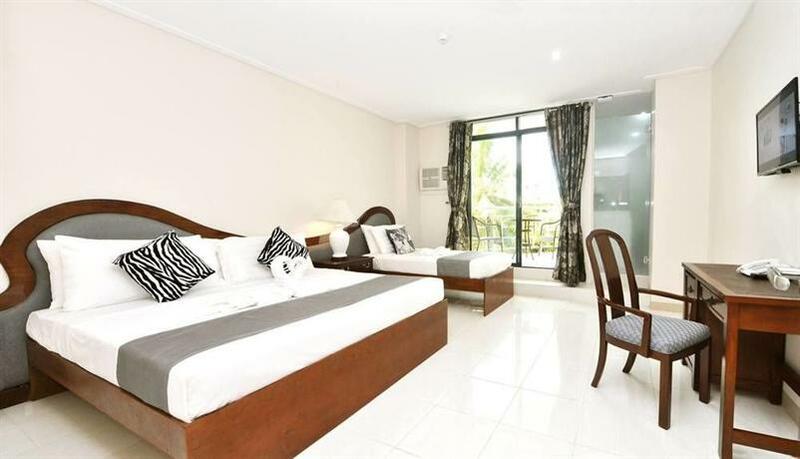 The view is no doubt exceptional, but the guest rooms are not that well-maintained. 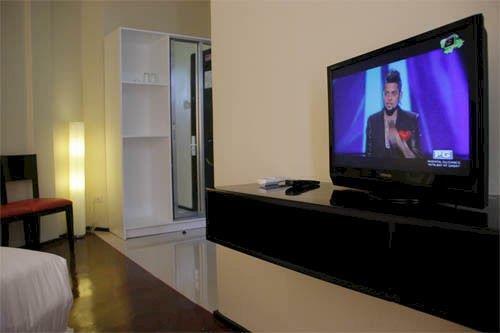 Because of this setback, most guests have reviewed the complex as being just an average hotel. 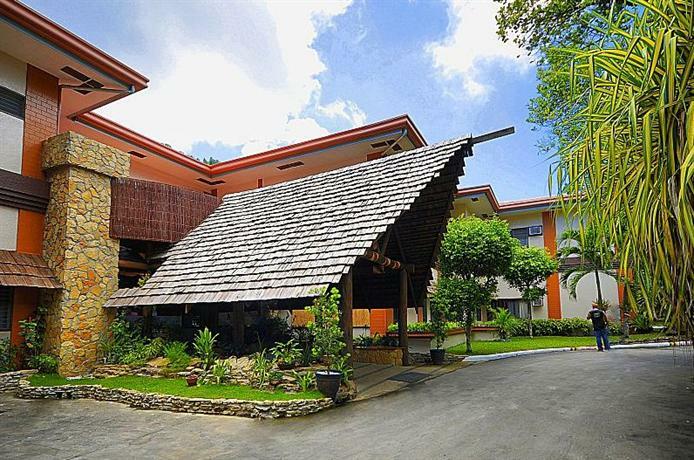 The restaurant usually serves Filipino cuisines, and the rate starts at around ₱1,200 ($26) per night. At the viewing deck, there will be several local tour guides that can help in taking photographs. If you are alone, you can ask them to take a picture of you. The high steep staircase to the deck is an exhausting climb. For those with medical condition, be sure to stop by every balcony to catch your breath. Don’t stop at the middle of the staircase, you might block other tourists from climbing to the viewing deck.